Amniotomy – Why it should be avoided. My opinion is no, if there is not medical reason for it (i.e. if the baby is already in fetal distress). The risk of an amniotomy far out weight any benefits, according to studies. The main reason practitioners perform this procedure is to “speed things up” but in reality this is not guaranteed and if it does, not significantly. Increased chance of cord prolapse. When the cord drops down below the baby and is squeezed between babies head and cervix. Increased chance of cord compression. When the cord is squeezed by the babies body with the uterus. Increased risk of Cesarean section. Increased risk of fetal distressed. Caused by the cushion around the baby being gone therefore the baby takes a much harder hit during contractions. 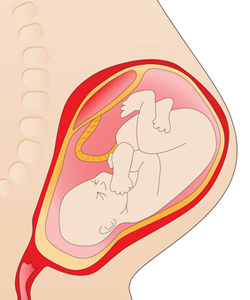 If the baby is not already in the “right” position, lack of fluid prohibits proper placement. Obviously these risk can happen whether or not the rupture of the membrane is artificial or spontaneous but more likely when you have a spontaneous rupture it is happening at the appropriate time for your body and baby, not when your practitioner says is a good time. Speeding up labor should not be seen as a necessity (unless for medical reasons) and you should trust that your body will work things out in the right time. Letting nature take its course is usually the best option. « How much is my responsibility?